The 8 passenger Rosa is the barge we chose to cruise this area. Her itinerary includes tastings of foie gras, local fine wines and Armagnac, together with guided visits to the artisans who produce them. 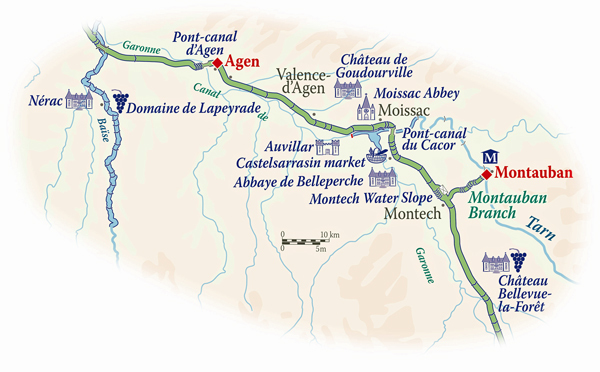 The cruise route also requires your captain to negotiate the amazing inclined water plane at Montauban and the 1000 foot aqueduct over the River Tarn as well as a short cruise along the river itself where in summer, the barge may moor under a weeping willow for guests to swim in its crystal clear waters. Rosa is a first-class, 8 passenger hotel barge that cruises in Gascony between Agen and Montauban from April and August.